Thrombosis is a common pathology underlying ischemic heart disease, ischemic stroke, and venous thromboembolism (VTE). The Global Burden of Disease Study 2010 (GBD 2010) documented that ischemic heart disease and stroke collectively caused one in four deaths worldwide. GBD 2010 did not report data for VTE as a cause of death and disability. 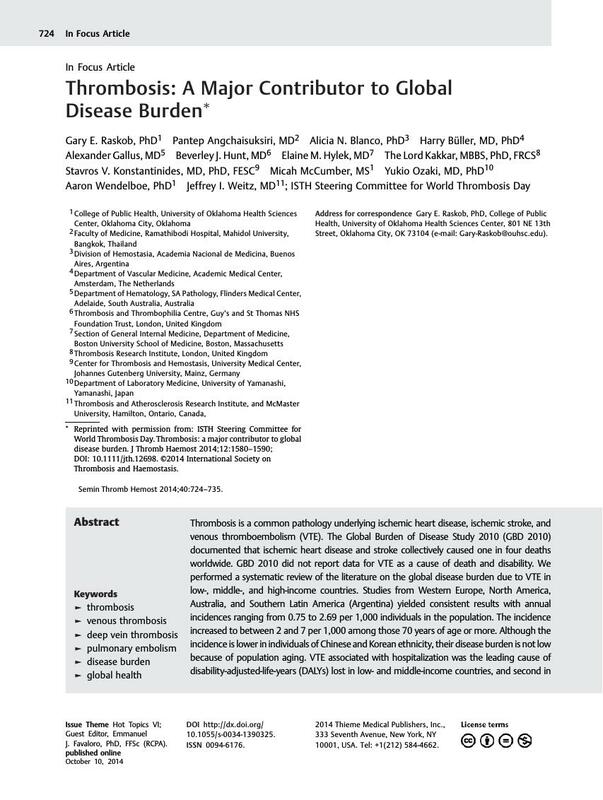 We performed a systematic review of the literature on the global disease burden due to VTE in low-, middle-, and high-income countries. Studies from Western Europe, North America, Australia, and Southern Latin America (Argentina) yielded consistent results with annual incidences ranging from 0.75 to 2.69 per 1,000 individuals in the population. The incidence increased to between 2 and 7 per 1,000 among those 70 years of age or more. Although the incidence is lower in individuals of Chinese and Korean ethnicity, their disease burden is not low because of population aging. VTE associated with hospitalization was the leading cause of disability-adjusted-life-years (DALYs) lost in low- and middle-income countries, and second in high-income countries, responsible for more DALYs lost than nosocomial pneumonia, catheter-related blood stream infections, and adverse drug events. VTE causes a major burden of disease across low-, middle-, and high-income countries. More detailed data on the global burden of VTE should be obtained to inform policy and resource allocation in health systems, and to evaluate if improved utilization of preventive measures will reduce the burden. * Reprinted with permission from: ISTH Steering Committee for World Thrombosis Day. Thrombosis: a major contributor to global disease burden. J Thromb Haemost 2014;12:1580–1590; DOI: 10.1111/jth.12698. ©2014 International Society on Thrombosis and Haemostasis.